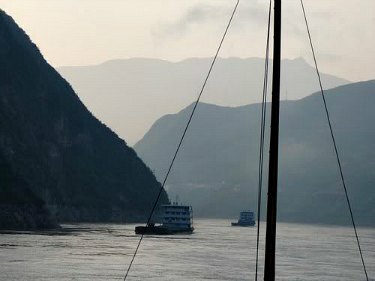 The Yangtze River Gorges are one of China's most famous scenic spots. 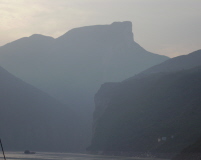 They extend for 200 kilometers and cliffs on both sides of the narrow passageways are hundreds of meters high. 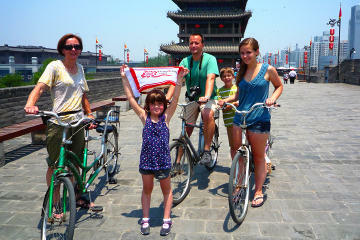 Peaks are as high as 2,000 meters. 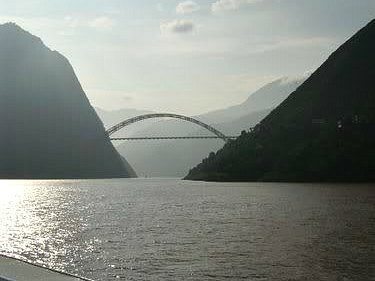 Even as the water level of the reservoir has been raised the full 175 meters, the visual impact of the gorges has maintained its splendor. 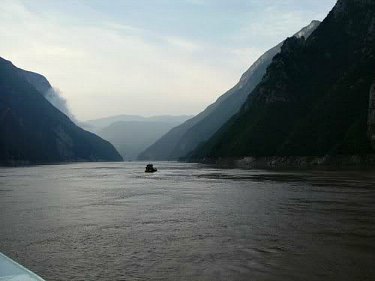 Qutang Gorge, the shortest at only 8 km. 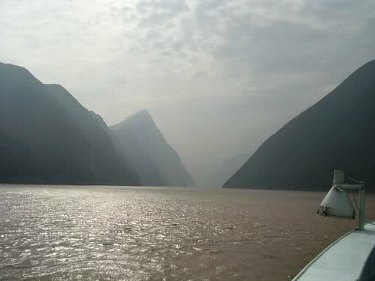 but considered the most spectacular because of the gigantic peaks that seem to enclose you as the river snakes and curves in very short intervals, truly a beautiful sight. 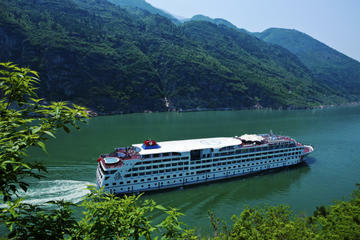 Watch this short video of the Three Gorges as our cruise ship advances through this most wonderful part of the Yangtze. 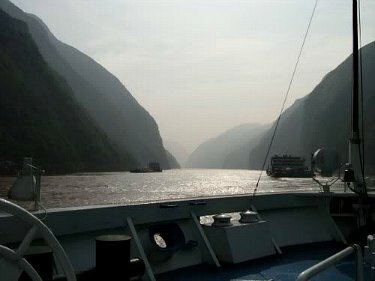 Then mid-morning the ship zig-zagged its way to the second gorge, Wu Gorge. 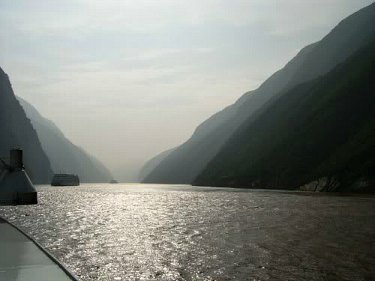 This is about 40 kilometers long, and it is in this area that the Shennong Stream intercepts the Yangtze. 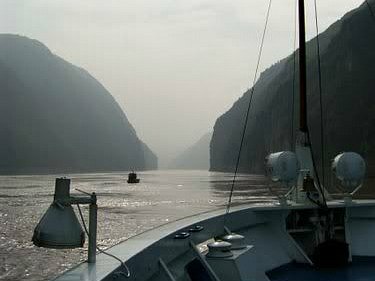 Now that water levels have been raised, it is possible to navigate to the shallower waters of the Stream, an awesome experience as we were transferred to smaller peapod rafts and entered the narrower gorges. 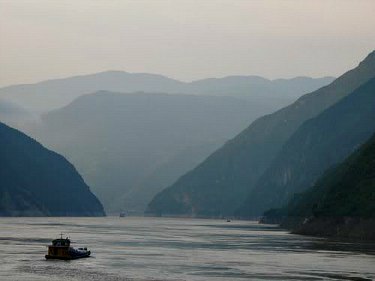 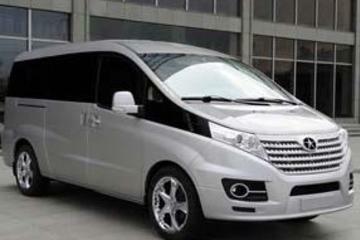 The third and final gorge, Xiling Gorge, is the longest one, at nearly 80 kilometers. 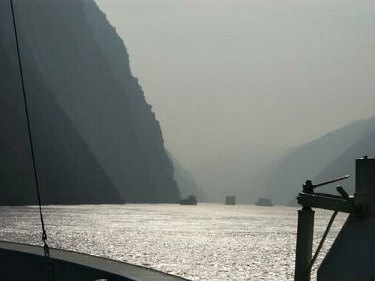 Right at the end, you catch a glimpse of the massive Three Gorges Dam Project. 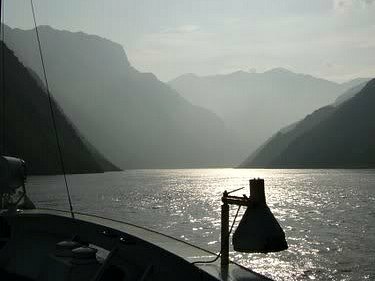 To the Yangtze River Dam!